Thinking about how all of you can come and visit in New Orleans and have an extraordinary experience of the strange and intimate kind–the experience you would never get on your own or with your standard tour groups. . .
We’ve put together a wonderful, multi-dimensional time in The Big Easy, that will include sketching for those who are so inclined. We’ll keep our eyes and ears open for special events (such as jumping into Second Line parades with their brass bands) that add spice and vim and vigor to New Orleans. Take a look and see if this suits your fancy, and if it does, let us know soon. We’ve set the limit at tenguests. Introducing the ever-ebullient Cassandra. She started doing tours in New Orleans in 2011, with an emphasis on the culinary—loves to take people to the great places locals visit but tourists never hear about. Besides that, she’s the source for inside tips on local music, artists, and history. Built in 1832, the Olivier House Hotel on Toulouse Street is a prime example of Creole Greek Revival architecture. There’s banana trees and fragrant flowers, a pool and your rooms have patio access. 3:00pm: Check in at the Olivier House if you arrive early, they’ll hold your luggage for you while you wander in the neighborhood of the French Quarter, or allow you an early check in if your room is ready). 4:00pm: We’ll take the streetcar up St. Charles Avenue, admire the Southern mansions, and lounge with snacks and a mint julep on the verandah of the famous Columns Hotel on St. Charles. 6:00pm-8:00pm: We’ll climb aboard again and reverse our streetcar adventure heading for the Ogden Museum of Southern Art o be part of their AfterHours evening of music and art. The quality and diverse media of the art in their collection is nothing short of exemplary. While we wander between the galleries, we’ll listen to local musicians with a national and international standing. A well-loved part of the Ogden AfterHours experience is the interview with the musicians by local radio personalities. Dinner on Your Own: We’ll provide a list of great restaurants in the city–some near the Ogden Museum, some in the French Quarter, some a short cab ride away. There’ll be cuisine for every taste. 10:00pm-??? : Still going strong? We’re happy to accompany you to the one or two of the hundreds of clubs in New Orleans—there’s music for everyone’s taste from blues to Cajun zydeco, classical, brass bands, smooth jazz and hard hitting rock and roll. Tell us what kind of music you would like to hear and we’ll search it out. Breakfast On Your Own: Choose one of the local breakfast spots (we’ll give you our suggestions) with full menus. 9:30am: Meet at the Olivier House for an historic two hour walk through the French Quarter and Jackson Square with a private guide from Friends of the Cabildo. and Caffe du Monde for coffee and beignet cafes. Noon: Will find us at Café Amelie where a special lunch will be prepared for us, and we’ll sketch the buildings, people and flowers in Café Amelie’s gorgeous gardens. 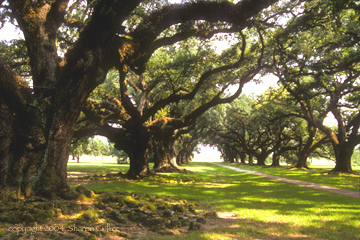 2:00pm: In the Quarter, we’ll catch up with Frank Relle, known for his iconic photographs of New Orleans mansions He’ll share a few secrets of how he captures the haunting light and atmosphere of these antebellum beauties and you’ll have a chance to see some of the work from his stunning portfolio of Nightscapes from New Orleans. (www.frankrelle.com). One of Frank Relle’s luminous and haunting photographs of New Orleans at night. East into the Marigny/Bywater: For those who would enjoy more wandering in the neighborhoods, we’ll walk East out of the French Quarter to the Marigny/Bywater, two of the up and coming neighborhoods of the city. Originally settled by the French, and showing the distinctive shotgun style of homes with delicate decorative details, these areas are experiencing an art and culture renaissance. 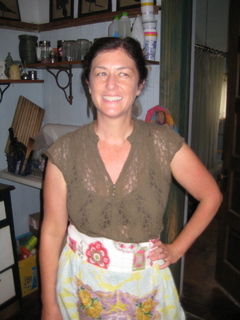 We’ll visit artists’ studios: Kate Beck’s studio with stunning hand painted silk clothing and scarves (katebecktextiles.com). drop into antique shops, hang out somewhere around Piety and Desire (“STELLA!!!! !”), and absorb the locals’ side of old New Orleans. Sticking Close to the French Quarter: Take a nap; chill out on the patio of the Olivier House or wander on your own in the city. We suggest visits to The Louisiana State Museum at the Cabildo, or the 1850 House showing life as it was in mid-nineteenth century New Orleans; and The Presbytere which houses a Mardi Gras Museum and the new, interactive multimedia exhibit Living with Hurricanes: Katrina and Beyond. 7:00pm-10:00pm: You know you can’t come to New Orleans without going to Preservation Hall. 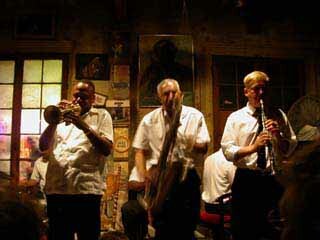 We’ll have an early dinner in the neighborhood and be at the doors of Preservation Hall by 8:30 for a fabulous evening. Preservation Hall opened its doors in 1961. The hall was created as a sanctuary, to protect and honor New Orleans Jazz which had lost much of its popularity to modern jazz and rock ‘n roll. Every night, the hall is filled to capacity with people eager to hear New Orleans jazz played by veteran musicians in their 70’s and 80’s and younger musicians learning and embracing the sweet and beautiful music of their city. Stop for coffee and croissants and then we drive ½ hour to the Honey Island Swamp, one of the least-altered river swamps in the country. It’s pretty much in its original condition, almost a pristine wilderness. 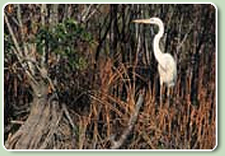 We’ll take a personalized narrated nature tour into the 250-square-mile swamp. Nearly 70,000 acres of it is a permanently-protected wildlife area–the Nature Conservancy’s First Louisiana Nature Preserve. Turtle, herons, egrets, alligators abound!! Lunch: At Liuzza’s one of the city’s most popular local eateries. 1:00pm: Bike Tour up the historic Esplanade Ridge to City Park. Esplanade Ridge with its gorgeous mansions was known as the “millionaire’s row” of the Louisiana Creole society of New Orleans. We’ll also drop by one of the famous cemeteries of New Orleans-they’ve had their own starring role in such novels as John Berendt’s Midnight in the Garden of Good and Evil. 2:00pm: At City Park, we’ll have a lecture by Davis Baker, botanist and environmental ecologist, and an expert on the centuries-old oak trees (City Park has the largest stand of mature live oaks in the nation). 4:00pm-5:00pm: Leisurely ride back to the French Quarter, through neighborhoods adjacent to Esplanade, all with their own ambience and architectural flair. Look for the iron fences and gates shaped and painted like corn husks, the magnolia trees, and classic verandahs. Late afternoon: Take a nap; chill out in the patio of the Hotel Olivier or wander on your own in the city. We suggest visits to The Louisiana State Museum at the Cabildo, or the 1850 House showing life as it was in mid-nineteenth century New Orleans; and The Presbytere which houses a Mardi Gras Museum and the new, interactive multimedia exhibit Living with Hurricanes: Katrina and Beyond. Evening on Your Own: We suggesthearty snacks, drinks and music at The Three Muses on Frenchmen Street, where Creole Cottages abound and the scene is pure New Orleans. Check out the other clubs in the area, too, where you’ll find everything from blues to jazz, the wild Mardi Gras Indians, traditional brass and jazz bands, rock and roll and soak up the street music, in this, one of the world’s most exciting music locales. There are many area restaurants from high end to casual dining—we’re happy to provide our recommendations, and accompany you there. 9:30am- Noon:Meet at Olivier House for a short stroll to House of Blues for a rousing Gospel Brunch to end our time in New Orleans. We’ll feast on a wide variety of breakfast/brunch fare– everything from shrimp to chicken jambalaya, scrambled eggs, omelets, BBG ribs, couscous and Champagne mimosas –yep, we’re in New Orleans! And while we brunch away, we’ll take in the soul-stirring music that was born in the churches of the South. 12:30pm: Check out from Olivier House. We all say good-bye, but guess New Orleans will be in your heart and we’ll be seeing you again. Paypal: It is also possible to pay both the Deposit and Balance by Paypal. If you choose to do this, please add 3% to the Tour Fee to cover Paypal charges.